Not only that, but we'll be going in costume! Okay, so my husband will be going in a 150th Gettysburg t-shirt I bought online in advance, but our little 3 year old girl will be going in her Boone dress. When I made it before she decided to hate it and refused to even try it on. When I showed it to her again yesterday she gasped and said how pretty it was and even gave it a hug! Sheesh! :-) Our 6 year old boy will be going in an outfit I'm pretty proud of. I just finished his pants yesterday. We had to fit on grosgrain ribbon for suspenders since the pants were still too big for around his waist. Overall, though it turned out awesome! And, yes, even I will be going in a workdress and my lovely straw hat. I had to tell myself a few times that it was okay that our daughter was not going to be wearing a chemise or a petticoat (striped cotton capris underneath!) and that both kids will be in their matching leather brown sandals we got at Walmart, etc... I am just happy that we will have something fun to wear and that we won't have to look like the rest of them. I dearly detest being a "spectator", so going in costume will make me happy. The kids even have straw hats, because I had to draw the line there. There was no way I went to all that trouble to make a costume and my son would only have a baseball hat to wear on his head. For my son's outfit I purchased the plaid linen and cotton print at my favorite fabric shop in Gettysburg. I used a Period Impressions pattern and while it seemed fairly straightforward, the directions were horrendous! I ripped out a minimum of 15 seams. It was ridiculous. If it weren't for my years of previous historical sewing experience I would have been totally up a creek. The drawings were vague without the right or wrong sides of fabric marked in the pictures and some of the directions seemed incomplete. Nevertheless, I triumphed and the pants are complete! My first ever mid-1800s boys pants! And my first fly ever. Don't tell anyone I used coconut buttons. They do not have pewter at JoAnn's! My handsome kid in his new outfit! His sleeves aren't buttoned so pardon his missing hands. haha! 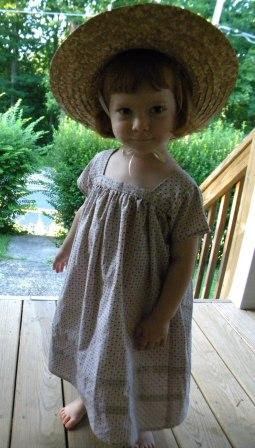 My sweet little girl in her Boone dress and straw hat. Your son looks terrific! I love the plaid trousers. They are awesome. The Boone frock is awesome too. Have a great time at the event! I am jealous; I wish our family could attend! It's just a bit too far away. Hi Sarah! Thank you. I'm happy with how they turned out (and surprised too considering the poor directions)! I wish you could come out for Gettysburg too. It's fun to make it out to the big events, but the distance with a young family isn't easy. I hope your events out there are cooler than Gettysburg was!